Accomplishing a minor premiership, 15 wins and an average winning margin of 56 points, the Sharks raised the bar as the very best in the competition in 2018. Amassing eight wins and finishing fourth on the ladder, Subiaco have emerged as the surprise package of the finals series. With two consecutive wins over third placed Swan Districts and second placed Peel Thunderbirds, they’ve certainly hit peak form at the right time. Winning their last flag in 2015 as the Coastal Titans, the club will be looking to secure their first premiership in their new maroon and yellow colours. Meeting a the fourth time this season for the 2018 premiership, Subiaco will be looking to move past East Fremantle – a team who has already beaten them three times this year. East Fremantle Vice Captain Ashlee Atkins said the club was treating the upcoming grand final just like any other game. “Our preparation and mindset wont change in that sense,” Atkins said. Fresh off her 2018 Dhara Kerr Best and Fairest win on Monday night, AFLW Fremantle Docker and Subiaco Lion Captain Hayley Miller’s prolific form has been telling in 2018. Displaying effective run and carry, racking up the clearances in droves and exhibiting gritty tackling pressure across this season, her ability to win the ball and use her effective skills with both hand and foot is certainly going to make a difference come grand final day. Other influential AFLW players to take the field include former Mundella WAWFL leading goal kicker Ashlee Atkins (East Fremantle), Melissa Caulfield (East Fremantle), midfielder-forward Gabby O’Sullivan (East Fremantle) and midfielder Evangeline Gooch (East Fremantle). 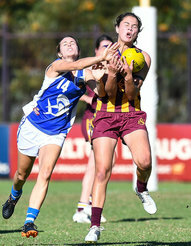 Former Fremantle Docker Amy Lavell (Subiaco) is coming off a four-goal performance in the preliminary final against Peel, and will be looking to continue her superb form in front of the big sticks. Subiaco Coach Simon Quayle said he had relished the opportunity to promote skill and understanding within the squad throughout the season and looked to take that into Sunday’s grand final. 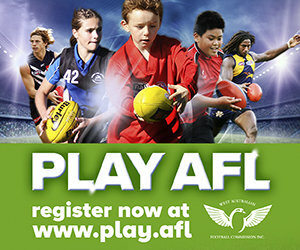 “There were heaps of new players with limited exposure to football. My approach and message was to teach the game, coach the person,” he said. Simon said the Subiaco squad were over the moon and were using the week to reflect on their growth over the duration of the year. “East Fremantle are an outstanding group, coached well and have a full list of good players. They deserve to be the outright favourite. We’ll be preparing as normal; focus on skills, focus on team, focus on what we do well,” he said. The 2018 Mundella WAWFL League Grand Final will be played at Claremont Oval on Sunday August 26 with bounce down at 2.30pm, following Reserves at 12pm and Rogers Cup at 10am. All games will be live streamed on the Mundella WAWFL Facebook page.